Was on the program today (well, technically yesterday, the 23rd). The DSAT Gas Blender course consists of two parts, the Gas Blender part and the Gas Blender Instructor part. Laura is participating in this course and on the same day we were also looking into the Equipment Instructor Specialty, since filling Nitrox tanks is slow business with our partial pressure filling system and this gives plenty of time to combine these courses. 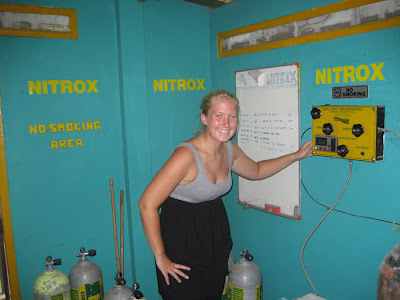 One of the prerequisites for becoming a DSAT Gas Blender is that one is a PADI Nitrox diver and for the DSAT Gas Blender Instructor course that one is a Nitrox Instructor, both ratings held by Laura. 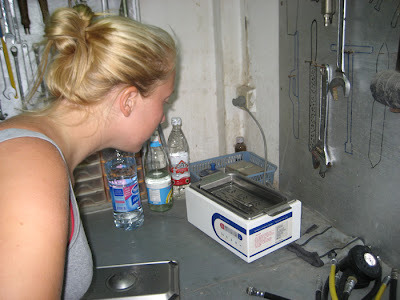 Here she's looking at the ultrasonic bath, a machine that cleans, in this case, dive equipment, like regulator first stages, or in this case, helps to make equipment 'oxygen clean'. The Gas Blender course is a 1 day course which is very challenging, since setting up and operating a safe gas mixing facility can only be done by people with the right equipment and knowledge. That is what this course of instruction is all about. The DSAT Gas Blender course will instruct you in the safe methods of gas blending. As a gasblender you must know and understand the physical properties of oxygen, its various forms and purities, hazards and special handling requirements. 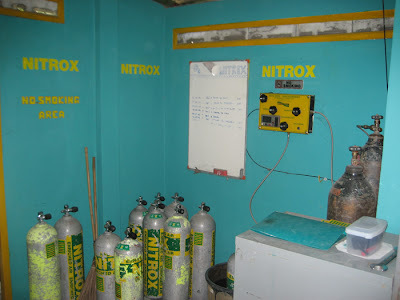 This picture shows our Nitrox blending facility, on the right hand side of the wall is the blending console. Diving with enriched air nitrox lets you safely extend your no stop time beyond the no decompression limits for air. Diving with enriched air means more time underwater – but you need to be certified as an EANx Diver to get enriched air fills. Enriched air fills should only be mixed by people with the right certification. Here's Laura in action on the mixing console. The Equipment Specialty course familiarizes you with the operation and maintenance of your dive gear. The more you know about how your gear works, the more comfortable you are with it, the more performance you get from it and the better you can care for it. 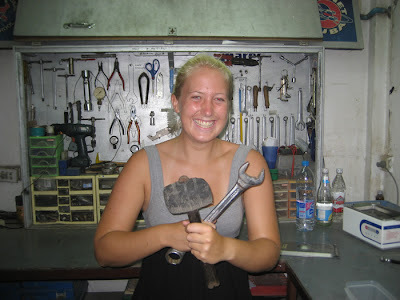 Laura has her own ideas on how to fix equipment, it almost looks like the socialist way of fixing things, with a hammer and a wrench! It was good fun today, Laura filled a good amount of Nitrox tanks and she also learned about how to make things oxygen clean. On top of that, she got to take apart some regulator first and second stages and more challenging, put them together again, without having too many (or rather any!) parts missing or left over. All in all a good day Hope you enjoyed the pix and the story, please feel free to leave your comments or questions.